Beyond Research – Pathways to Impact’ was a showcase event celebrating RMIT’s cutting edge approach to research. As the inaugural conference of RMIT’s Enabling Capability Platforms (ECPs), this special event encompassed three days of presentations and workshops across the eight interdisciplinary ECPs. Designed to provide value from our excellent research and provide those outside the academic community a pathway to deliver ultimate positive social, economic and environmental outcomes from the value created via our research excellence. The conference and surrounding communications campaign was a significant moment in RMIT’s move from an institute intensive approach to research to inter-disciplinary virtual platforms. The real challenge behind Beyond Research and the ultimate impact it needed to have was to bring research students, staff, stakeholders and external partners along in this new journey of research value creation at RMIT. We worked with RMIT to create the event visual identity and communications to launch a change program surrounding the restructure of research at RMIT. 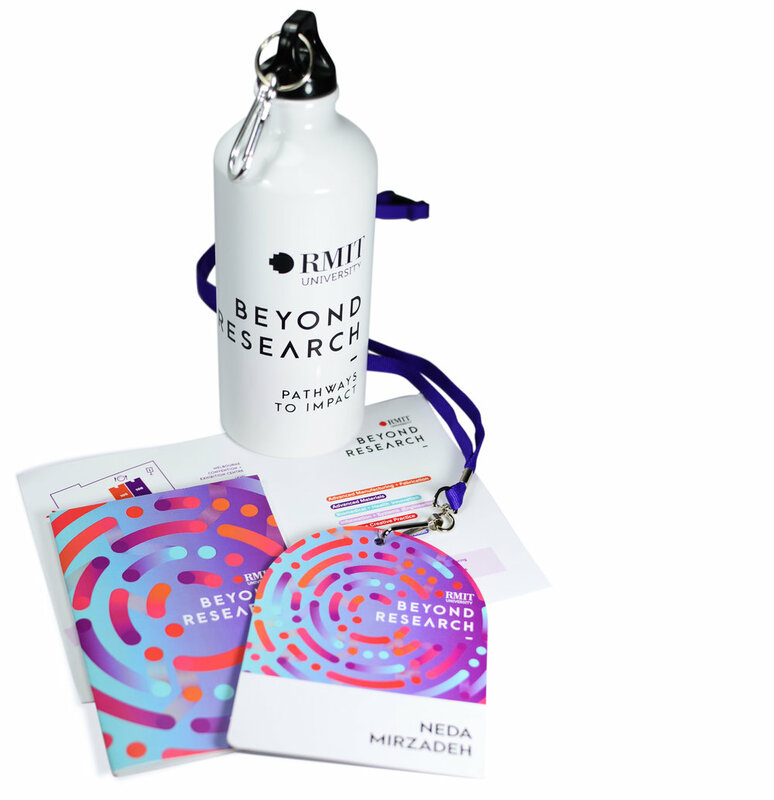 The Beyond Research event visual identity was created using Wildwon's research and immersion process which resulted in a design that resonated with a broad range of stakeholders spanning RMIT staff, students, stakeholders, researchers and industry professionals. Wildwon immersed ourselves in the world of research at RMIT, conducting interviews with key people from the highest levels of leadership at the University, through to Higher Degree by Research (HDR) students and industry partners. We also conducted an immersion workshop with subject matter experts within RMIT to glean knowledge and insights that would help us navigate communications of the new approach to research and bring all audiences along on the exciting journey. We utilised tools such as personas, empathy maps and experience design principles to apply a consistent and considered experience across tailored communications with different audience groups and of course, the event. The graphic device is made up of a set of eight circles that visually move together as one cohesive unit, representing collaboration between RMIT’s eight ECPs. The graphic device is both complex and simple enough that different audiences will draw different conclusions about it. To someone working in the biomedical research space, it may look like a petri dish, or to an engineer, a circuit board. It was designed in a way that allowed for it to be scaled, cropped and rotated to show interesting visual communications across all media – creating different iterations that still feel like a cohesive identity. The spatial design of the event became a physical manifestation of the brand for Beyond Research, with design details spreading to floor and wall decals, lighting and staging. Alongside a fully comprehensive style guide, deliverables for this project included colour scheme and branded wraps of foyer spaces, floor decals, branding of lecterns, branded stages and furnishings, main auditorium lighting states and large-scale signage. RMIT was committed to producing low-impact, re-usable and recyclable event collateral, such as water bottles and bags, as well as finding solutions to produce the less waste right across the program. This vision was translated into action by using minimal disposable packaging and repurposing event signaging for future events. Even to this day staff at RMIT keep using the bags and water bottles which proves how important sustainability is in experience marketing. Lift visibility: Celebrate the diversity of research capability elements across the university and further enhance the position of RMIT as a leader in the interdisciplinary approach to research. Research translation: Continue to evolve a university culture of research translation to benefit others outside the academic community. Human element and networking: Educate industry around RMIT's new approach to research and collaboration. HDR Engagement: Demonstrate the value of being involved in the ECPs; ‘what’s in it for me’. Introduce new ECP Directors: Profiling and familiarising the leadership across research and innovation. Professional development and training: provide opportunity to lift capability across key skill sets. The event was successful in engaging with affiliates in the new cross-disciplinary research platforms and introducing the ECP leadership with a high impact brand and event. The event had a significant visual and word-of-mouth impact and included spectacular speakers and content, creating a compelling case for change amongst RMIT and its stakeholders.